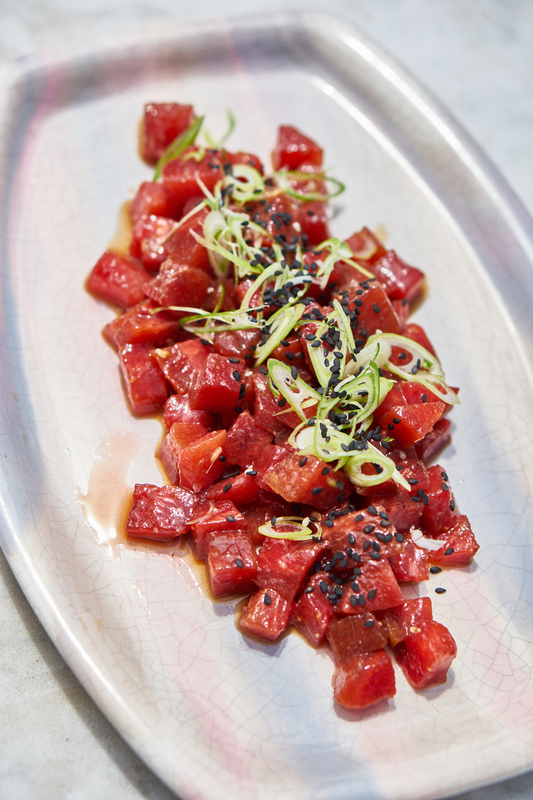 Poke is a much-loved, traditional, raw fish preparation, long popular in Hawaii. Fishermen would season bits of their catch, and snack on it, while working. 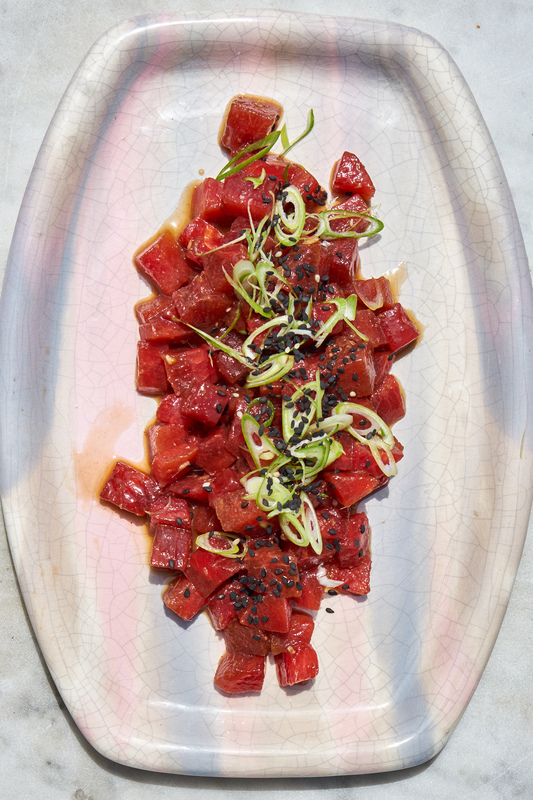 Poke (pronounced poh-kay) has exploded in popularity, well beyond Hawaii, in recent years. The poke bowl functions as ambassador in poke spots around the world, in thousands of different guises. This watermelon poke recipe is for any of you who love the idea of poke or poke bowls, but don't eat fish for whatever reason - diet, religion, etc. This watermelon poke recipe is one of the main components I like to use when assembling vegetarian or vegan poke bowls at home. In the Hawaiian language, poke means to slice or cut, which is why this is called watermelon poke. Even though there is no fish involved. I love eating it when the weather is warm. Watermelon poke is light, clean, bright, vibrant, and beautiful. I'm posting this now, and will follow up in the coming days with different ways to assemble a vegetarian poke bowl made with this watermelon poke. The good news is you don't actually need the perfect melon here. This recipe is quite forgiving, and the sauce is quite assertive. The main thing you want to want to pay attention to? Whether or not your melon is seedless. You're after a seedless water melon. This is key. It can be red, it can be yellow, just so long as it's seedless. This way you can maintain cube-like cuts. Related to watermelon poke, sauce is king. Getting it right is key. I've tried a range of sauces and marinades to season the watermelon here, and always fall back on the sauce I've used for years in the Otsu recipe you'll find in Super Natural Cooking. It is the perfect mix of soy sauce, sesame, with a kiss of cayenne, and hint of lemon. It compliments the sweetness of the watermelon perfectly. You marinate the watermelon for a few hours (or overnight), the melon cubes soak up the flavor, and seem to firm up on the texture front. You can enjoy watermelon poke, simply prepared, with just a sprinkling of toppings, as pictured here. Or, you can have it as a component in preparations like poke bowls, or wraps. I like it alongside rice, or on top of a bed of rice noodles. If you have plain rice vinegar, go ahead and use that. I just tend to keep brown rice vinegar on hand. Make the sauce by combining the zest, ginger, honey, cayenne, and salt in a food processor (or use a hand blender) and process until smooth. Add the lemon juice, rice vinegar, and soy suace, and pulse to combine. With the machine running, drizzle in the oils. Slice the watermelon into cubes that are roughly 1/2-inch - 3/4-inch in width. Transfer to a large bowl or container. Pour the sauce over the top of the watermelon and gently toss. Refrigerate for a few hours, or overnight. If you remember to toss the watermelon once or twice along the way, even better. Use a slotted spoon to transfer the watermelon poké to a serving bowl or platter, shaking off extra sauce. Reserve any remaining sauce to use as seasoning (for a poke bowl, or to season rice, etc.). Sprinkle with sliced green onions, and sesame seeds.